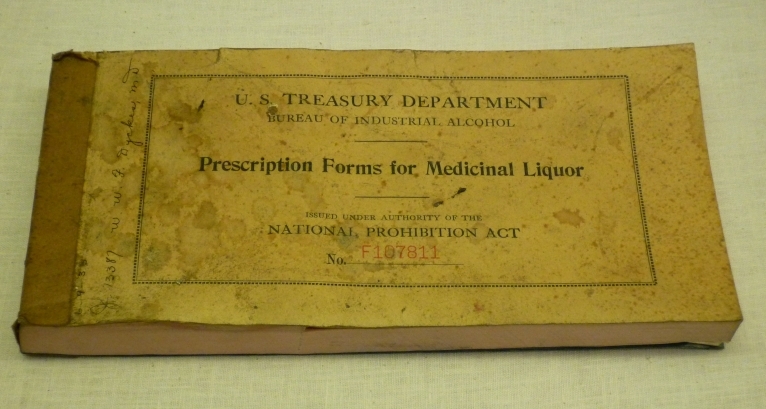 You know, it really doesn’t dawn on you that people could easily get whiskey during prohibition until you see the medicinal whiskey prescriptions and logs that were used during the time period. Meticulous records were required by the Treasury Department’s U.S. Prohibition Service similar to the FDA today. Just as some of the bottles of whiskey from this era survived, so did the actual prescriptions. At the Rose Melnick Medical Museum you can view not only the prescription pad doctors used but also the prescription log book. Some of the entries in the book are fantastic examples of the kind of ailments you would have to have in order to procure the water of life. Influenza, acute pharyngitis (aka “sore throat”), bronchitis, and acute coryza (aka “the common cold”) are just a few. I highly recommend you view the original photos at the museum site as they are huge, high resolution gems.